Keith had a pretty unique way of entering the specialty coffee world. Keith spent six years living out of a pickup truck while following The Grateful Dead. After Jerry Garcia passed, everything kind of came to a halt. With no true plan going forward, Keith got in touch with a Dead Head friend who’s bus had broken down in, you guessed it, Mount Shasta. Upon moving to Mount Shasta full time, Keith’s wife Jen (whom he had also met while following The Grateful Dead) landed a job as a barista at a local coffee shop and cafe. Somewhere down the line Keith heard that there was a roaster’s apprentice position open with the shop. He went in to inquire about the job and was asked if he was comfortable lifting 60 pounds over his head. The answer was yes and next thing you know Keith was roasting coffee. After the first year or two with the company Keith began to realize that there’s probably a little more to coffee roasting than loading beans and opening a hatch. Thankfully, the shop he was employed with was a member of the Specialty Coffee Association of America. He spoke to the owner of the shop and they agreed to cover half the cost of all of his SCAA training. Through both SCAA and The Roasters Guild Keith gained endless roasting knowledge, even getting a bunch of help from now-SCAA Director of Symposium, Peter Giuliano. After eight years with this small coffee roaster, the 2008 recession came knocking. The shop couldn’t take the hit and eventually had to close it's doors. At this point Keith and Jen decided that it would be a great time to take a shot at venturing off on their own. 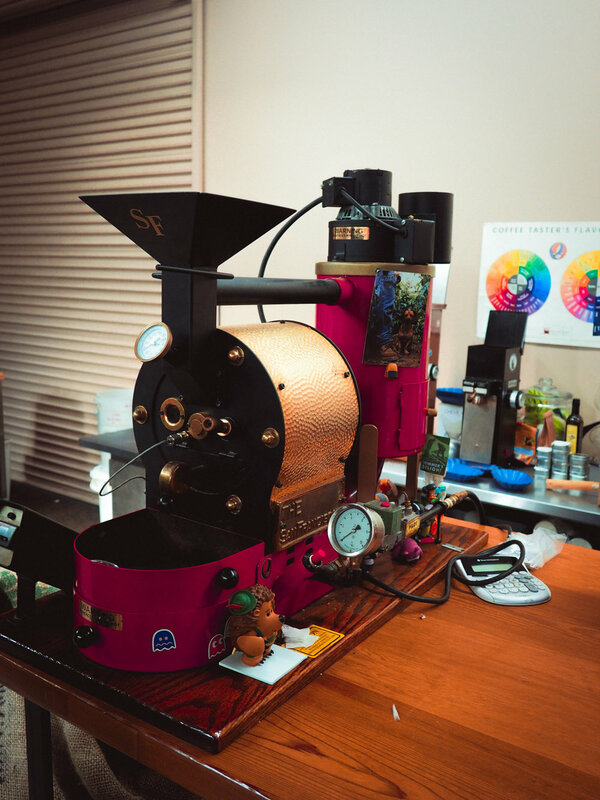 They started with a small 7lb roaster that Keith had purchased while working at the previous coffee company. They quickly grew out of that roaster and have been truckin' ever since. Northbound Coffee Roasters is currently roasting on a 15 kilo 1956 Probat roaster imported from Germany and sample roasting on a beautiful San Franciscan 1 pound roaster. I originally found out about Northbound through social media. I was extremely impressed with their coffee offering, beautiful packaging, and web presence. To my surprise, the e-commerce sales only account for a small fraction of Northbound’s business; just around enough to cover rent each month. In fact, Northbound exists primarily as a wholesale roaster. Almost every grocery store in the Mount Shasta area offers coffee from Northbound and they continue to grow their wholesale clientele across state lines. For a specialty coffee roaster that’s primary market is consumers that purchase their coffee from grocery stores, one would guess that there isn’t much room for more expensive, lighter roasted coffees in Northbound’s everyday lineup. Enter Northbound’s Headstash Collection. Every now and again a coffee broker will send Keith a sample bag of coffee that will just blow the socks off everyone around the cupping table. More often than not, the price point on these coffees are too expensive to invest in and offer to grocery stores. Luckily, more and more brokers are offering up smaller bags of these great coffees. When available, Keith will purchase small 15-22lb bags of great coffees and keep the bag for his personal coffee drinking needs. Northbound will put small quantities of these mind blowing coffees up for presale through their site and typically sell out of these coffees before they’re even roasted. If you want to check out what’s currently in Keith’s Headshash, you can check it out here. 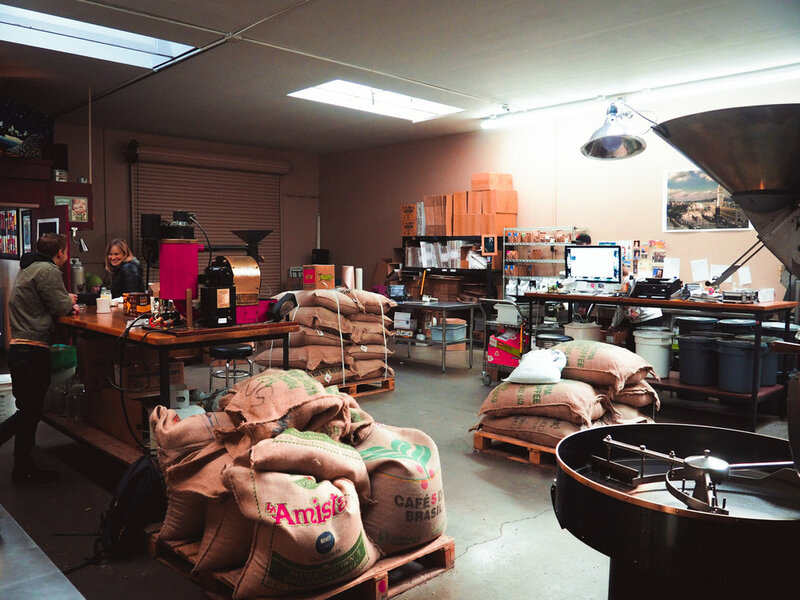 If you want to learn more about Northbound Coffee Roasters and check out the rest of their offerings, check it here. Also be sure to check out a few more photos from our visit with Northbound below. Can’t thank Keith and his team enough for having us and schooling us on the business of roasting coffee. Entryway into the Northbound warehouse. A wide selection of brewing equipment and Northbound goods that can be purchased via their webstore. 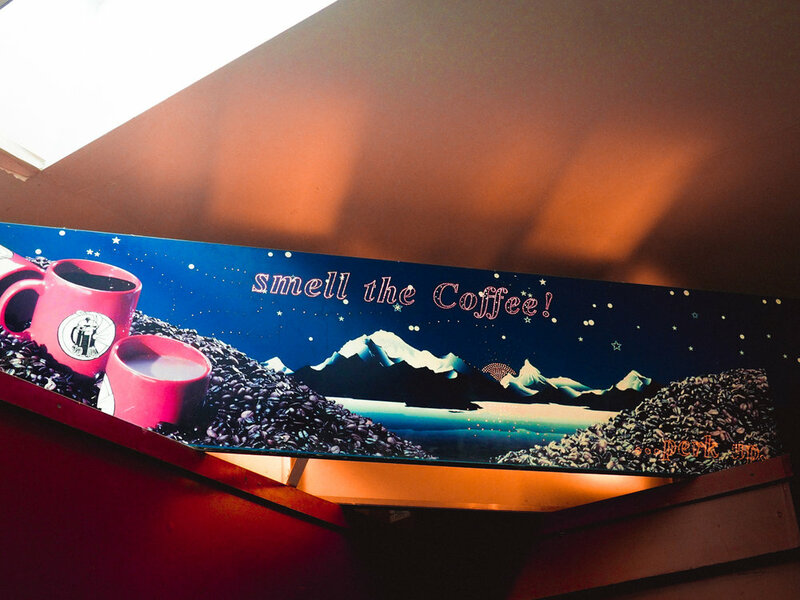 Gifted to Northbound from a friend, a light up coffee sign that was saved from the dump. Originally existed in an old gas station. Northbound's San Franciscan 1LB sample roaster. Northbound's facility where their team of three (sometimes four when their son is home from college) roasts, cups, packages, and ships their coffee. Owner Keith Hamrick tells the story of their 15 kilo 1956 Probat roaster.